So we heard about the PS4 officially last night, with heard being the appropriate word since the thing was being kept out back somewhere. Not that it really matters at the end of the day since it'll look good regardless since it's an electronic device from Japan, and even if it didn't, for someone to genuinely refuse to buy a console based on how it looks would be so inane and retarded that they don't deserve nice things anyway. As long as the thing isn't made out of sun dried dung or has corners quite as sharp as the original design of the PS3 (yes that thing hurts like hell if you ever manage to get low enough to hit your head on the thing), then it's fine as far as I'm concerned. 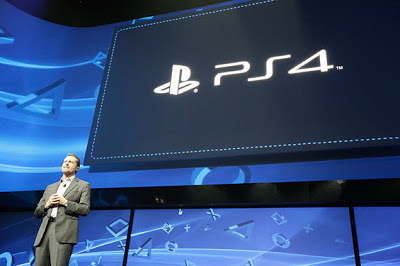 The only thing that actually worries me is the reasoning for not showing, whether a joke or not I can't quite tell, has been stated by the Sony Worldwide commander in chief Shuhei Yoshida, that they need “something new for later”. Although the fact that the presentation focused solely on the network applications and some brief glimpses of software was nice, I am worried if they're running so low on content that wheeling out what is essentially a metal box is the next great reveal is slightly disturbing.